In the summer, I like to adapt my beauty routine to be ready for hot conditions. This summer is no exception! First, humidity makes my hair frizzy. Plus, I really have no patience to do the full brushing routine. Because of the heat I suppose? So the frizz definitely becomes an issue for me! Second, since I have very sensitive skin, I do my best to avoid the sun’s UV rays. Whether I’m at home, at work, or on the go, I like to have sunscreen close. Third, even though gone may be the days where it was in to get a deep tan, I still like to use self-tanners to turn my white skin to at least a light beige. I find that many of my summer clothes come out way better on me when I have a healthy golden glow. I’ve been buying some of these products for a few years now, so these are products that really work — tried and tested! But I’ve also made a few great discoveries this summer that I think you’ll find useful and enjoy. 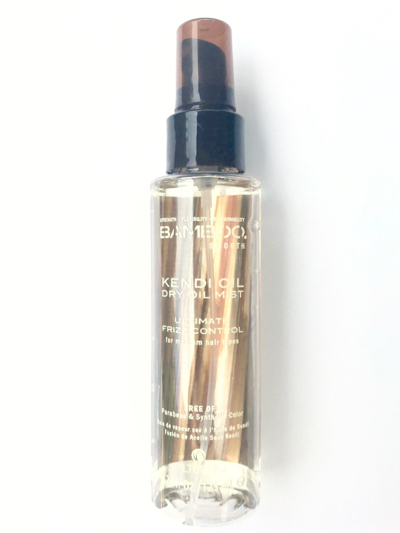 Bamboo Kendi Oil, dry oil mist. This is one of my newest discoveries this summer. It controls frizz and makes my hair shiny. It especially does a good job with the short frizzy hairs that stick up on the top of my head. I always wonder if these are new hairs of damaged hair…you know what I mean? The smell is soft and pleasant, a bit like an aqua smell. You will find it at Sephora’s and on Amazon. Beauty Tip: I prefer to spray it on once my hair is dry. Then I use my fingers to spread the product a bit and to make those tiny curly hair on top of my head disappear. You can also spray it on damp hair if you prefer. I spray generously (6 to 8 times) at a good 6-inch distance. If you tend to have oily hair, you may want to go a bit lighter with the number of sprays you use, to test how your hair reacts. 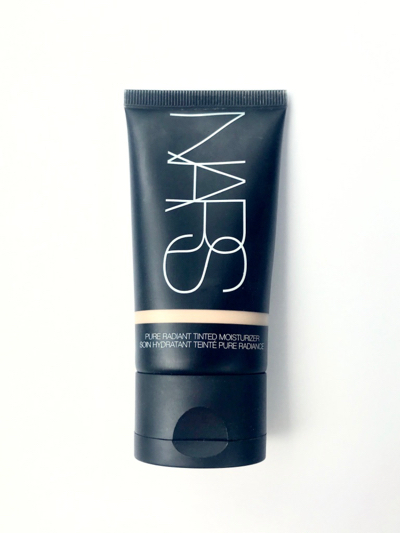 Nars Pure Radiant Tinted Moisturizer. This is one summer beauty product I’ve been going back to for many years now. I also like the La Roche Posay CC cream I’ve written about here. The advantage of the Nars moisturizer however is that it’s offered in 12 shades. So you can find the one shade that best matches your skin color. It is lightweight, has a broad spectrum of 30 SPF, and looks really natural. I use the shade ‘Groenland’. Beauty Tip: I personally use a large brush to apply the cream, but a beauty blender will also do a great job. You can find more info about how to use a beauty blender and brushes here. To avoid getting an obvious line between my jaw and neck, I apply bronzer powder with a brush to bring it down onto my neck — a bit on each side, and a bit lower down in the front center part. 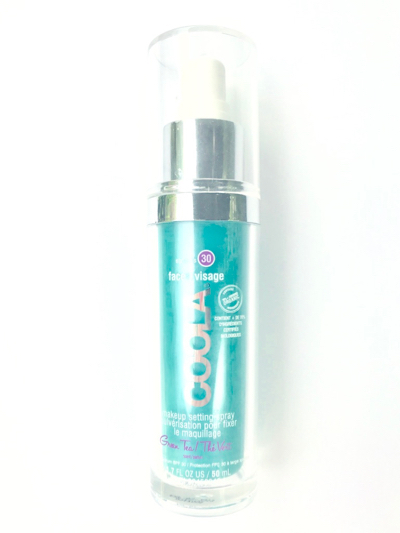 COOLA makeup setting spray. Another great discovery is this 30 SPF spray that I use when I already have makeup on. Whether it’s before I go out for lunch at work, or before I leave the house during the weekend, it’s perfect to protect my face and neck. Applying Tip: This product has SPF and will hurt your eyes if you keep them open while you spray. So make sure you close your eyes and mouth when you do. Actually when you read the directions on the bottle, it specifically says to spray the product on your hands first and then apply. Go figure, it doesn’t make much sense to call it a makeup setting spray. I’m pretty sure that they do this to avoid getting complaints from people who end up spraying it in their eyes. Hold the bottle from a distance of at least 8 inches, or more. If you spray it from too close, you’ll end up with patches on your makeup and will not be happy with the result. 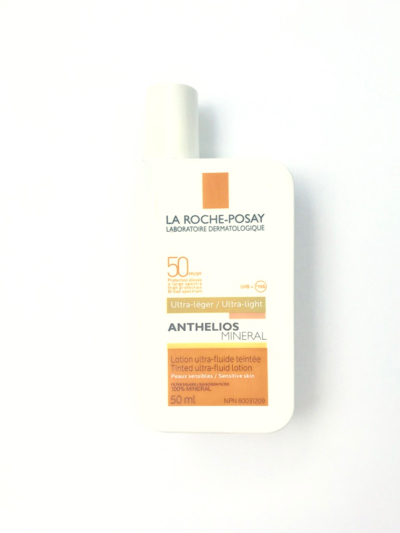 La Roche Posay 50 SPF Tinted ultra-fluid lotion for face. Another favorite of mine. While this fluid is very efficient to protect your skin, its light texture also means you are left with no greasy film. This is what I wear on weekends when I don’t feel like putting any makeup on. I love the fact that it protects my skin, in addition to giving it an even finish thanks to its light beige tint. Beauty Tip: You can easily use it on your neck and ears as well, so there’s no color transition between your jaw and neckline. 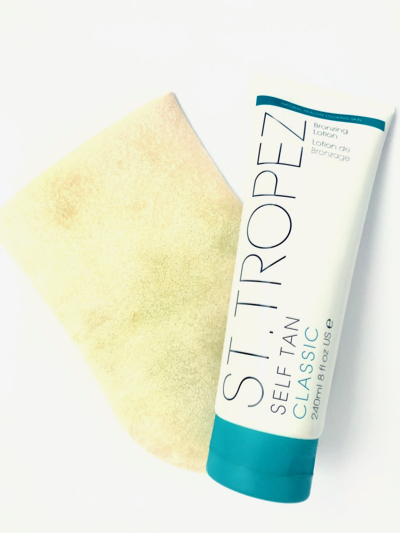 St-Tropez Classic self tan lotion. This lotion was introduced by the brand this year, and is meant to last longer than their other products. I do see an improvement in terms of lasting effect compared with their well known Classic bronzing mousse. I appreciate the fact that you right away get a slight tan as you apply it (so does the Classic mousse though). The smell is not bad at all. Beauty Tip: My ultimate ‘faux-tan’ beauty routine is to combine this lotion which serves as the base, with the Biotherm self-tanning bi-phase oil (on which I talk more here), which I then apply every 2 days. This allows me to keep the tan going for quite some time. I therefore apply the St-Tropez lotion once every 2 weeks or so. Applying Tip: I definitely recommend using the St-Tropez applicator mitt. It allows to spread the product evenly for a smooth finish, while avoiding to stain your hands. You don’t have to apply a lot of product to get a golden glow effect. If you have fair skin, apply sparingly at first to test the shade it produces on your skin. Finally, as is always the case when applying self-tanners, go very gently when you apply it on your knees, ankles, feet and hands. 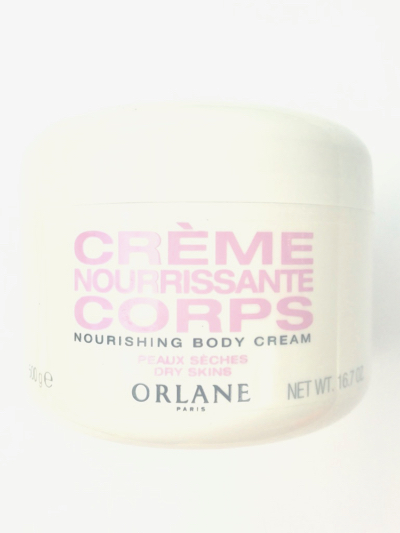 Orlane nourishing body cream: This cream has just the right hydration texture for the summer season. Not too greasy, yet efficient, plus a very light pleasant scent. Beauty Tip: Every 2 days or so, I try to incorporate hydration in my beauty routine. So one morning it’s the Biotherm self-tanning oil, the next, is this cream. 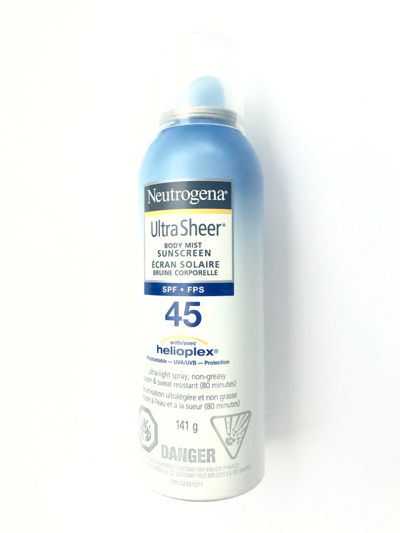 Neutrogena Ultra Sheer body mist sunscreen. Of course we not only want to protect our face from the sun but basically our whole your body. This inexpensive mist is perfect if like me you appreciate a quick and easy application. I keep a bottle at work so that if during my lunch break I know I will be out in the sun for more than 5 minutes, I’m equipped. Plus, since it’s not greasy as most creams, it’s got the texture I like to apply when I practice sports outside. 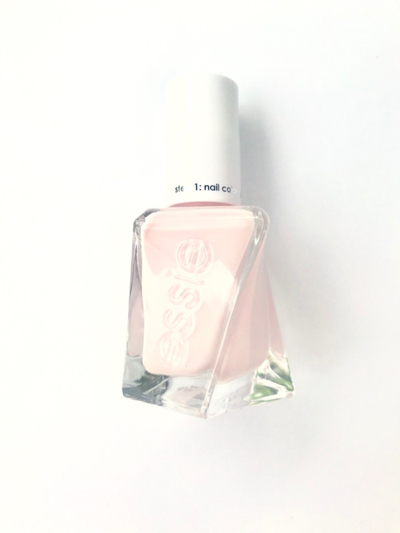 Essie gel couture #139. I am pleasantly surprised with this product. I know it’s been out for a while now. But I was reluctant to try it because of the ‘gel’ factor — afraid it would damage my nails (I have soft nails that tend to chip very easily). It is too soon to tell at this point if it damages my nails, I think so far so good actually. But regarding all other aspects, it’s a winner. I really like the brush (large with rounded sides), the texture, and, my manicure lasts 5 to 7 days. This particular color is the perfect light pink summer neutral color. Beauty Tip: I apply 3 coats to get a nice opaque finish. While they suggest you don’t apply a base coat but must buy their gel couture special top coat, I have been using my usual base and top coat products and the result is still great. So no need to spend on their top coat if you already have one that does a good job. 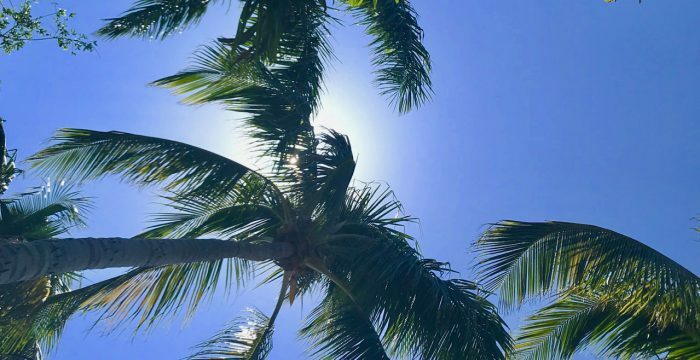 Take a second and let me know what is YOUR number 1 summer beauty product! Comment below!